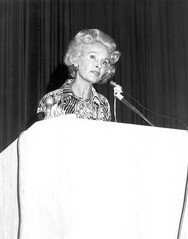 Jermaine Magnuson, wife of former Senator Warren G. Magnuson, at the National Cancer Institute's 40th Anniversary Ceremony in 1977. As a freshman congressman in 1937, her husband introduced a bill that would create the National Cancer Institute. In 1981, the NIH research hospital was renamed the Warren Grant Magnuson Clinical Center.